Courts Rule in favor of The Valley Patriot … again! Reject Kevin Thompson’s Bogus Lawsuit … Again! The Massachusetts Court of Appeals and the State Supreme Court have dealt a final defeat to Kevin Thompson of Methuen who unsuccessfully sued The Valley Patriot newspaper for libel and defamation of character stemming from an opinion piece published in 2006 (Father’s Priorities are out of Whack). Thompson filed his lawsuit against the newspaper and it’s owners individually. Thompson first claimed that Valley Patriot owner/editor Tom Duggan was the author of the offending piece (credited to freelance writer Tom Dunham). But, after weeks of harassing Duggan and sending crass and abusive emails, Thompson then changed his story and blamed Valley Patriot co-owner Paula Porten when he learned that Porten was also an attorney who has cases in family court. 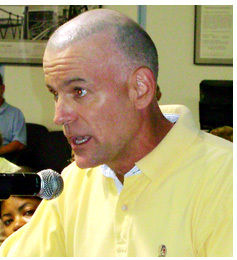 A Public Figure – Thompson wrote a book claiming he was a victim of conspiracies in the family court. The book was banned by Judge Manzi during his custody battle with his ex-girlfriend. The ban further fueled his conspiracy claims which he used to gain sympathy from local fathers who also felt (some legitimately) that they had been treated unfairly by the family court. Thompson began to engage in long, rambling rants on his website and on local blogs accusing Porten and Duggan of being part of the “conspiracies” against him. Conspiracies that apprently included Judge Manzi, his ex-girlfriend and others to deny him custody of his child, ban his book and cover up the “family court conspiracy”. He also accused dozens of bloggers (who ridiculed him) of “being Duggan” or “his … family court girlfriend Paula Porten”. Porten and Duggan contended all along that Thompson had a history of frivolous lawsuits and “because he had always enjoyed positive press before we came along, he just couldn’t handle it when one of our writers took him to task,” Duggan said. The Valley Patriot had previously given Thompson and his friends in the “Fatherhood Coalition” positive, free publicity including an “interview” that editors later found out Thompson had written himself and conspired to publish under someone else’s name. Judge Marita Hopkins said in her initial ruling: “One cannot be so prominent and vocal a partisan in a public debate, particularly when one has had a hand in creating the debate in the first place, and then cry foul at the rough and tumble of the merketplace of ideas. Thompson cannot establish that any of the claims in the op-ed are anything other than opinion or, if they are fact, that they are false. Therefore, he cannot, a fortiori, prove that they were made with “actual malice.” Consequently his claim must be dismissed.” – Judge Marita Hopkins, Justice of the Superior Court. 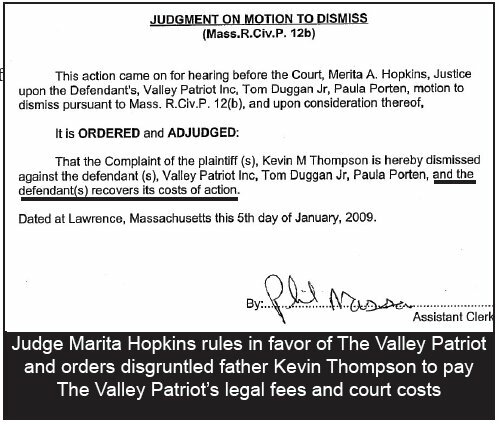 Judge Hopkins also ruled that Thompson had to pay legal and attorney’s fees to Paula Porten, Tom Duggan and The Valley Patriot. (see order on left). Valley Patriot editors estimate that they have shelled out more than $11,000 defending against Thompson’s “frivolous suit”. As he did in his failed attempt to gain custody of his son, Kevin Thompson represented himself in the initial lawsuit against the Valley Patriot as well as the numerous failed appeals that followed. In court papers, the disgruntled father accused Judge Hopkins of conspiring with the Valley Patriot, his ex wife, her lawyer, judges and members of the press. Thompson even personally attacked Judge Hopkins on his website (http://www.thompson4justice.com/hopkins.html). He also has a list of judges on his site whom he claims have committed “crimes” against him. “Clearly we are dealing with someone who has issues,” said Valley Patriot owner/editor Tom Duggan. After being warned several times not to discuss his “book” or his personal issues concerning his ex-girlfrind and son, Thompson repeatedly discussed his personal issues with high school students at Methuen High. After disciplinary actions failed to stop his behavior, he claims he was fired from his teaching position. Thompson sued the City of Methuen, the superintendent, members of the school committee the principal, his superiors and the teachers union for failing to defend his actions. Thompson lost every single one of those lawsuits after he had admitted on CNN’s Tucker Carlson that he spoke to his students about his book and his custody battles with the court. Lawrence Superintendent of Schools Wilfredo Laboy brought Thompson on board to teach science at Lawrence High School two years ago. He is still employed by the Lawrence Public Schools. Thompson ran for Mayor of Methuen in 2009 but finished third out of three candidates in the primary. He was called a “loon” by fellow candidates and ostracized by political activists for his outrageous behavior on the campaign trail and his bombastic, angry and sometimes incoherent blog postings on the Eagle~Tribune website. The Valley Patriot is represented by Andover Attorney, Peter Caruso of Divine Millimet. “We never took this guy seriously,” Duggan said. “He’s just a disgruntled father who was trying to blame his numerous failures in life on everyone else but himself. I know he’s looking for some kind of redemption after losing his kid but he’s not going to use us to get it. There was never any doubt that Mr. Thompson would lose at every stage of this, and we’re just glad we can now start recovering fees, court costs and damages from this frivolous suit,” Duggan concluded. The Valley Patriot still faces a second lawsuit by Attorney William DiAdamo whose firm was fired by the City of Lawrence after losing the Andrea Traficanti worker’s compensation case. DiAdamo works for the GLSD under Frank McCann, Traficanti’s husband and never officially disclosed that relationship. DiAdamo is suing the newspaper in an attempt to force Valley Patriot President, Tom Duggan to reveal his sources on the story of his firing which was reported on the radio but never even published in the pages of the paper. DiAdamo has admitted in emails that his real goal is to find out who blew the whistle on his firms losing their contract with the city. Valley Patriot president Tom Duggan says that he will spend “whatever it takes” in legal costs and court fees to protect his confidential source(s) on the story.